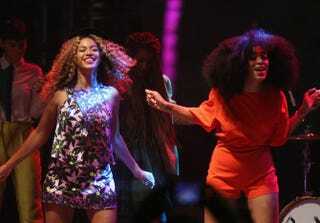 Beyoncé and Solange perform during day 2 of the 2014 Coachella Valley Music & Arts Festival April 12, 2014, in Indio, Calif.
Just days after attacking Jay Z in an elevator of New York City’s Standard Hotel, Solange Knowles packed her bags and headed to Costa Rica with sister Beyoncé. E! News reported that the two sisters hopped on a private jet to the tropical nation, presumably to attend Kelly Rowland’s rumored wedding. According to the flight manifests, Queen Bey and Solange entered the country Thursday, May 8, at 7:56 p.m. and left at 5:30 a.m. Saturday morning. According to local newspaper La Nación, Rowland; Tina Knowles; Rowland’s fiance, Tim Witherspoon; and Michelle Williams were also on the trip. Rowland’s wedding ceremony was rumored to have taken place on Friday, but that has not been confirmed. On Monday, TMZ released the shocking elevator footage of Solange attacking Jay Z on the night of the Met Gala, but statements from the parties involved have not been released. Just days after the fight, Beyoncé posted a cryptic Instagram post asking the Lord to help her make the right decisions about her relationships. We are shocked and disappointed that there was a clear breach of our security system and the confidentiality that we count on providing our guests. We are investigating with the utmost urgency the circumstances surrounding the situation and, as is our customary practice, will discipline and prosecute the individuals involved to our fullest capacity. Looks like someone’s going to have some explaining to do.